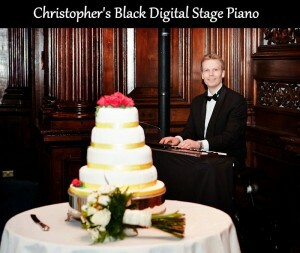 Award-Winning Birmingham Pianist for Weddings, Concerts, Private Functions, Corporate Entertainment and Special Events. Piano hire included. Fees from £250. If you’re looking to create a vibrant atmosphere for an important event there’s nothing better than live music. Hiring a professional pianist adds a touch of class to any occasion and creates a delightful ambience. Whether you require music for a wedding, dinner, concert, awards night, product launch or other celebration, the versatility of the piano makes it an ideal choice. Jazz, classical, popular and film music all sound equally good on the piano, so it’s perfect for clients who want to keep their guests entertained with plenty of musical variety. As the “Rolls Royce” of instruments, it’s perhaps not surprising that a recent YouGov survey revealed that the piano is the instrument people love best. Birmingham Pianist is presented by Christopher Langdown MMus(RCM), GRSM(Hons), DipRCM(PfT), ARCM(PfP), ARCM(PG), FISM. Christopher’s interest in the piano was first ignited when he was 9 years old and he won his first piano competition at the age of 11. More awards and competition successes following during his teenage years and, after finishing his A-levels, Christopher auditioned at the UK’s most prestigious music colleges and was awarded places at them all. He decided to further his musical studies at Royal College of Music in London and was fortunate to spend 6 years learning from some of the world’s finest musicians. Before graduating from the RCM with Distinction, he was selected as one of their piano scholars of “outstanding talent” and was subsequently invited to play for the Oscar-winning piano movie, Shine. Since then, Christopher has performed as a soloist throughout Europe, broadcast for Radio/TV and played at over 1,000 weddings and private events (several with celebrities and the Royal Family in attendance). He has also worked as a musician for musicals, adjudicated for music festivals and given piano masterclasses at home and abroad under the auspices of The British Council. 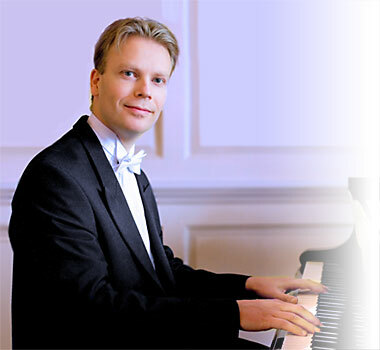 He has previously been a visiting teacher at the Birmingham Conservatoire and Royal Academy of Music and is currently Head of Piano Studies at The Kingsley School in Leamington Spa. Whilst living in London he was appointed to teach the family members of various stars including The Who guitarist Pete Townshend, TV comedians Adrian Edmondson and Jennifer Saunders, singer / model Sophie Ellis-Bextor, broadcaster Gyles Brandreth and the Oscar-winning actor Sir Laurence Olivier. It doesn’t matter if your venue doesn’t have a piano on site as Christopher can bring along a superb sounding digital stage piano (which sounds just like a grand piano) at no extra cost. It’s worth noting that the sound quality of this instrument is far better than 99% of hotel pianos – visit the Audio page to hear the piano for yourself. However, if you would like Christopher to play the venue’s own piano he will be delighted to do so assuming that the instrument is in good working order and in tune. As a classically trained musician, Christopher has a very discerning “ear” and works hard to get the best possible sound set-up for clients. For example, whenever possible, he can link up the digital piano to a discreet remote speaker to provide a much better sound coverage. This means the music can be heard clearly by everyone, not just those who are standing/seated near the piano. Yet Christopher’s music is never obtrusive as he realises it’s very important that guests can converse easily with one another without having to raise their voices. Being moveable, the digital piano can be relocated from one room to another in about 15 minutes or, if you prefer, two pianos can be set up ready beforehand for a smooth transition. This is all done free of charge as part of Christopher’s great service. If you require music outdoors, please ensure adequate protection from the sun / wind / rain is provided. Grand piano hire is also available on request. If you’re after the elegant look of a baby grand piano for your occasion, Christopher can provide this beautiful portable Digital Baby Grand Piano. 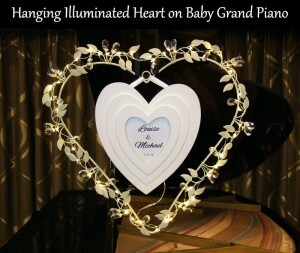 For weddings, Christopher can also offer the hire of an optional Hanging Illuminated Heart decoration which fits on the piano and features the names of the bride and groom. 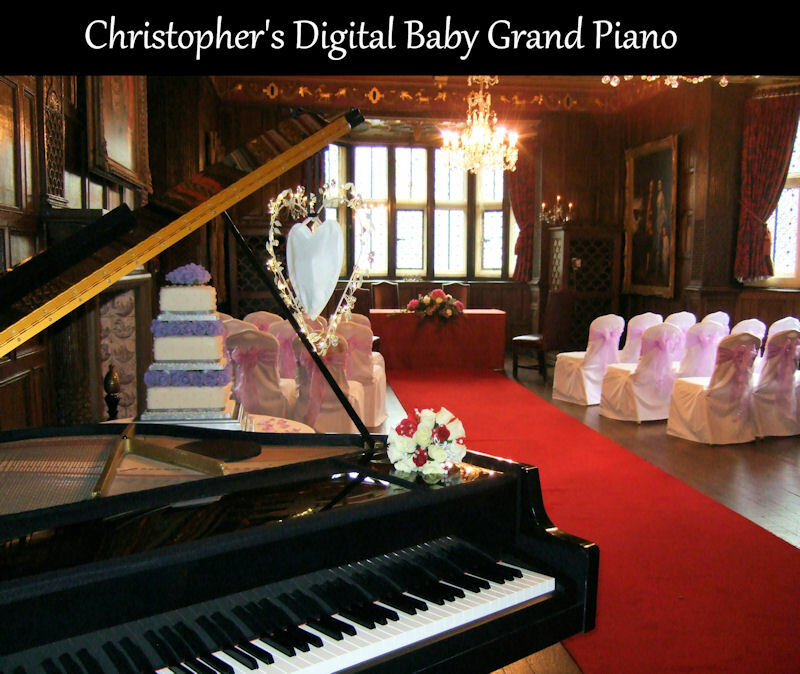 The Digital Baby Grand sounds just as good as an acoustic grand piano – the only difference is the cost (an acoustic grand usually costs around £450 to hire, whereas Christopher’s piano is available for £175). 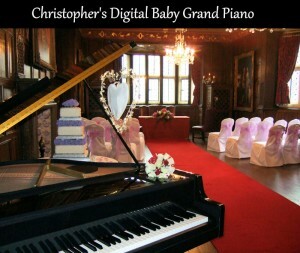 Please note that the Digital Baby Grand requires 6 x 4 of floor space and mains power. If your event is not taking place on the ground floor of the venue, please contact Christopher to discuss accessibility. 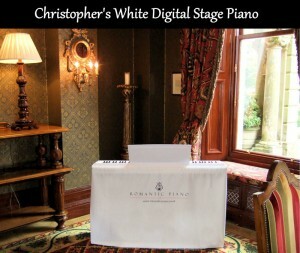 Christopher’s music is very popular with brides and grooms. He is usually asked to play for the wedding ceremony, drinks reception and afternoon wedding breakfast. Please visit the Weddings page for more details. With a fully comprehensive presentation of jazz, classical, pop and film music, Birmingham Pianist is the ideal musician for any occasion. Bookings for corporate events are especially popular, as are private functions including dinners, birthdays and anniversary celebrations. Enquiries for funeral receptions and christenings also come in from time to time. Christopher usually performs in black tie but is happy to wear something less formal if you wish. Visit the Functions page for more information. Fees start from £250 – please get in touch with Christopher for an exact quote. Before a booking is confirmed, a basic booking form will need to be completed.